We have been hearing more and more about 22″ bikes and it looks like a few brands will be adding a 22″ bike to their line ups for 2017. We caught wind that United have been working with Kye Forte on a signature 22″ bike a little while back, and it looks like it’s finally hitting BMX shops and mail-orders that carry United worldwide now. Above is a quick promo where Kye talks a little bit about the bike with a few riding clips mixed in for good measure. Below, you can find full specs and details on the bike with a full parts list and photos! Check it! “Long time UNITED pro Kye Forte has always been one for doing things his way and in this, his 10th year with United, he still isn’t afraid to go against the BMX norm and mix things up. Here’s a closer look at his brand new 22′ United KF22 2017 Complete bike and some thoughts about the place of 22″ bikes in BMX today. As ever, Kye doesn’t hold back on or off the bike. As we talked about above, the KF22 complete BMX Bike from United is a 22″ bike. The bike starts out with a 100% 4130 chromoly frame with a 73.75-degree head tube angle, 71-degree seat tube angle, 12.25″ bottom bracket height, 9″ standover height and 14.1″ chainstay length (slammed). The frame features gusset on the down tube, a tapered top, down and seat tube, tapered chain stays, a Mid bottom bracket and removable brake mounts. The fork is 100% 4130 chromoly with a 1-piece steerer tube and integrated bearing race, tapered legs with angled ends and CNC machined dropouts. The bars are also 100% 4130 chromoly with an 8.75″ rise, 29″ width, 11-degrees of backsweep, 3-degrees of upsweep. These bars feature large dual radius bends to increase the overall strength. The rest of the bike is decked out with United, Revenge and Innova parts from top to bottom! HEADSET: United sealed bearing, int. The KF22 has a 21.5″ top tube length, comes in colors of semi-gloss black and gloss dark army green and weighs in at 26 lbs. The bike comes with a $928.99 (£699.99) price tag. More photos below. Sealed United Supreme front hub laced to a Revenge double wall 22″ rim and Innova tire. Sealed United Supreme cassette hub laced to a Revenge double wall 22″ rim and Innova tire. United Slim Tripod seat kevlar material with custom sewn patch on rear. It’s good to see some more dirt contests starting to pop up again. Here’s a video we spotted over on Can You Dig It from the first round of the UK BMX Dirt Series! Although this appears to have been a smaller contest, there were plenty of familiar faces dropping in on the roll in to throw down! Check out all the highlights above! Really hope this series picks up, really digging this. Not one, but two videos we spotted over on Can You Dig It from the Green Acres Trails Jam that went down at Kye Forte‘s new trails over in Devon, U.K! Check out highlights from guys like Mike “Hucker” Clark, Anthony Napolitan, Chris Doyle, Corey Bohan, Jay Cowley, Lima Eltham and many more who turned out to throw down. Looks like the trails were running solid and everyone was having a hell of a good time! Get on those play buttons and take in all the good times. “Some big names such as Mike “Hucker” Clark, Anthony Napolitan, Chris Doyle, Corey Bohan, Jay Cowley, Lima and more throw down some big tricks at Kye Forte’s trails. Here’s a short but sweet one from this years Goodwood Festival over in the UK! Get a look at Chris Doyle, Mike ‘Hucker’ Clark, Ben Wallace, Matt Roe, Kye Forte, Leo Forte, Corey Bohan, Tom Justice and Harry Main spending some time jumping the dirt jumps and riding the wood quarter. Based off the footage, this was more of a good time since the trains and doubles action look to be pretty far from serious. Still some great riding in this, as you would expect from a crew like this! Some of you might know this, but Kye Forte is a lover of all things with two wheels! Not only does he crush it on a BMX bike, but he’s real good on a mountain bike and dirt bike as well! Red Bull caught up with him to talk about how he got into bikes, the similarities and differences between all three and of course to film a ton of dialed riding! Check it! 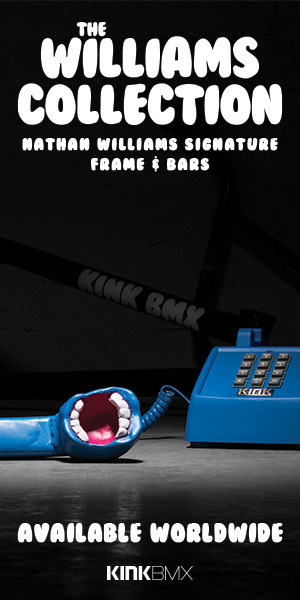 “As a BMX dirt jumper, Kye Forte is one of the UK’s most celebrated and influential riders. He’s not a man who is happy to confine his love for two wheels to the smooth berms and sculpted lips of his local trails however. Taking influence from his father, Kye has had a long-running love affair for the noise and fury of motocross. More recently though, he’s turned his attention to downhill mountain biking which he feels provides the perfect medium between the two. Can you spot what’s different about Kye Forte’s current setup is? Make your way over to Can You Dig It to find out just what Kye is running to that might make you curious to try it yourself. United just posted up this quick clip of Kye Forte having some fun on the MASSIVE Red Bull Quarter Master setup a few weeks back! I wonder how fast he got going in this? So crazy!